For a couple of weeks I had been noticing an exhaust leak on Rosie during my one hour commute into the city in the mornings while the world is still dark and again on my one hour (or more) commute home in the evenings. When I first started hearing it, I checked all the flanges where the bolt on the cylinder heads and all of the clamps the length of both exhaust pipes. But again the next day, I swore I could hear an exhaust leak. Kinda like hearing a piece of paper rattling over the edge of a can. Slowly I started noticing the bike's mellow rumblings controlled by the tuned muffler system seemed more raw, gutty, and loud. I checked the mufflers to find no fault as well. But with all of the heat shielding strapped over the exhaust pipes, one can only see the underside of most of the exhaust system. But what could I be missing? As time rolled on, I kept thinking it seemed louder and back fired a bit when rolling out of the throttle like an old pickup with a burned out muffler. I also noticed that the engine's torque seemed a little flatter than normal. All of these symptoms pointed to an exhaust leak to me. Finally, one afternoon, I started the bike on its side stand to let it warm while I put on my riding leathers before my commute home. I thought I might as well wave my hand around the exhaust work closest to both heads while it was running to detect where the leak could be. I waved my hand around the front cylinders exhaust system and could not detect any warm air escaping. I checked the rear cylinder from the left side of the bike, same findings. I then checked the rear cylinder from the right side of the bike and whoa! there is hot compressed air belching out there. I leaned over and squinted my eyes to see if I could see anything. And, in the narrow space where two heat shields come together, there was just enough of a gap to see a crack in the exhaust pipe below it and occasional sparks coming from the crack. Harley-Davidson had designed a crossover pipe between the front and rear exhaust systems. This crossover looks like a large horseshoe running from the left side exhaust to the right side exhaust, and the top of the upside down "U" has a short piece of pipe that connects to the rear cylinder. 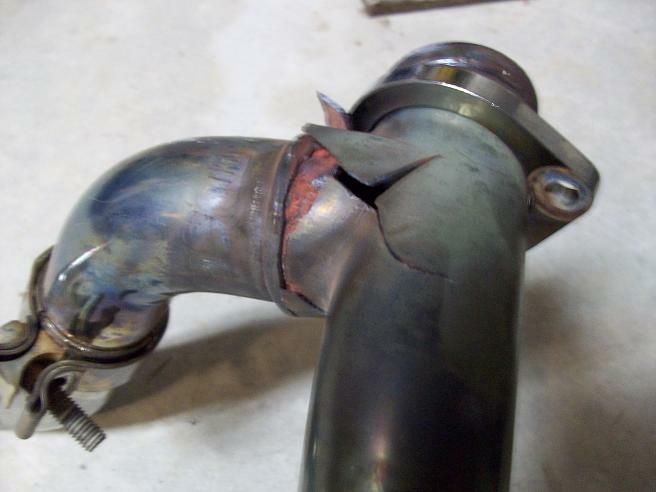 Where that short piece of pipe connected to the top of the upside down "U" is where the exhaust had cracked. The crack looked more like a small rupture which explained why it sounded louder and produced backfire when rolling out of the throttle. This leak was right under the front edge of the seat. So, I spent Saturday removing all of the heat shields to take a better look at the exhaust system. I soon found that the crossover had indeed failed and appeared beyond repairing by welding. New exhaust would have to be installed. Fortunately, the bike was equipped with slip-on mufflers that could be retained. I located proper replacement parts and put them on order and returned to the garage to remove the old exhaust pipes. Once having them removed, it was apparent the crossover pipe was no more, worms food, pushing up the daisies, it had shuffled off its mortal coil, it was the ex-crossover pipe. And as a side note, a considerable amount of WD-40 is required when removing "slip-on" mufflers from exhaust pipes that have seen 35,000 miles of riding before said mufflers just slip right off. This evening, the new Sampson pipes were delivered, so I set down and installed them. They definately look a lot better than the old pipes, less confusion and no more crossover. Nice one piece pipe on both sides. No more exhaust leak under the seat either. All the exhaust is going thru the mufflers again. The nice refined sound she used to have is back and the throttle response seems much better. Interesting and pretty plumbing for a fancy exhaust. Nice repair work too. If I get the chance, I will pull the headers off the K75 and get them treated to a deep black finish from Jet Hot. Thanks, Jack. I think highly of Jet Hot. We used them to treat headers when we were racing stock cars. You people baffle me. All this mechanical work and it's just a pleasant weekend or evening diversion. Three months later I'd still be trying to get the old slip-ons off! The hot air coming up from the front of the seat could be nice. The sparks not so much. I wonder if that is how Riepe got the name for his bike? Boy, that's one hell of a leak. Is this common on these bikes or is this some odd fluke? I can understand the joint failing, but that almost looks blown out. Strange. Well, it's good to see another wrencher out there. Most of the Harley boys I've met just polish and leave everything else up to the professionals. the large X crack is what I saw before removing the crossover from the bike. It spread open while removing it which gives the blown out look. The whole joint just down to the side had failed and it had developed an open X crack at the first turn from the head. I haven't had an opportunity to compare notes with anyone yet that has experienced this. Most of the guys I have talked to changed to true duals within the first 5,000 miles of buying their bikes for the sound of it. Apparently the original owner was fine with the stock pipes and the Screaming Eagle slip-ons as was I when I bought it used of the dealership floor. Thanks for the kind words. After years wrenching my own cars and trucks and then my own race cars, it just seemed normal to wrench my own bike. I am having a similar problem on my import harley I purchased from a guy in LA a few years back. Thanks for the tip! @2014 Allen Madding. Awesome Inc. theme. Powered by Blogger.